Only a living, breathing Hindenburg disaster like Hillary Clinton could make a 74-year-old socialist like Bernie Sanders seem like a fresh and charismatic “new face.” All over America, people are looking at the ancient wife of Bill Clinton and wondering how out of 320 million people, the Democrats could have possibly picked her as their nominee. 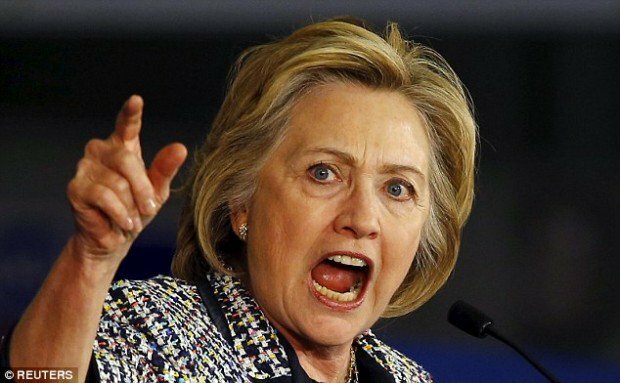 This is a woman who is simply not fit to be President of the United States. Why? 1) She’s responsible for Benghazi. There have been endless Benghazi investigations and if you believe the mainstream media, you’d think nothing came out of them.However, we did learn that over 600 requests were made for more security. In the end, four men died and Ambassador Chris Stevens’ body was dragged through the street because Hillary Clinton never acted to safeguard their lives. Since when do we reward government officials with a promotion after their negligence has gotten people killed? 2) She hasn’t accomplished anything. Sean Hannity has a bit on his radio show where he challenges liberal callers to name Hillary’s three greatest accomplishments. Listening to them hem and haw while they try to come up with anything is hilarious. What her fans don’t want to admit is that despite her mediocre tenure in the Senate and as secretary of state, her real “accomplishments” are being married to Bill Clinton and being female. Take those two “non-accomplishments” away from her and she wouldn’t be in the top 1,000 people considered to be president. 3) She’s a liar’s liar. Merely calling Hillary Clinton a “liar” makes her sound too much like an ordinary politician. To the contrary, Hillary is what a lying liar who spent all her days working at the lie factory on a lying machine would sound like. She lies about the big stuff, the little stuff and everything in-between. This is a woman who falsely claimed that she landed under sniper fire in Bosnia. A roughly equivalent lie turned Brian Williams into a running joke, but there’s so much more with Hillary. After Benghazi, she told the American people that a video was responsible when she was privately telling people it was a terrorist attack. She claimed that she came out of the White House dead broke and in debt. She said she applied for the Marines in 1975 and was turned down. She claimed she was named after the explorer Sir Edmund Hillary who became famous when she was six years old. You can go on and on with the list. Yes, nobody expects politicians to be as scrupulously honest as pastors, but how can you vote for someone who’s so dishonest you can’t ever take anything she says at face value?4) She belongs in jail. In America, no one is supposed to be “above the law.” Not you, not me, not the president of the United States. Yet, if Hillary Clinton doesn’t go to jail over having classified emails sent to her private server, it will be purely for political reasons. She knew what she was doing was highly illegal from day one. Not only are there people in jail for doing less than she has, any normal person with a government security clearance who did what she did would EXPECT to go to jail if he were caught. How can anyone be okay with voting for someone to be President who would be in jail if she weren’t married to a former president and running for office herself? 5) She is utterly corrupt. Back when Bill Clinton was in the White House, Hillary received $100,000 in bribes in return for putting $1,000 into the cattle futures market. The odds that Hillary did that honestly have been computed at 1 in 31 trillion. That was small potatoes compared to the deals Bill and Hillary appear to have cut with foreign governments. Enormous sums went directly into Bill’s pockets for doing speeches or to the scammy Clinton Foundation and next thing you know, the State Department was doing favors for those shady deep pocketed donors. With Obama in office, Hillary will never be investigated and prosecuted for what she’s done, but she deserves to spend the rest of her life in prison. She should be running for president of her cellblock, not president of the United States.